When Microsoft announced the official end-of-support date for Windows XP, media around the world signaled this event as the end of an era. But to enterprise security professionals, the end-of-support for 25% of the market is a terrifying prospect. Botnets, which rely on infecting computers with weak defenses, will become more powerful as XP support drops off. Today marks the official end-of-support for Windows XP, which means no more security updates for Windows XP installations. Non-supported Windows XP installations will not get updates and will overtime become less secure and easier to hijack. As millions of XP machine become less secure, we will see more Windows XP machines usurped and zombified for malicious web attacks. Now that Windows XP machines will be easier to hijack, more nodes will be available to botnets to make attacks on web servers. This will impact the day-to-day of CISOs and security professionals who’s job it is to protect web infrastructure from attacks. While many organizations are focused on upgrading to more modern operating systems, it’s the devices that they have no control over that may end up doing the most damage. It boils down to this: while an enterprise may do everything right to upgrade and protect its own computers, they don’t control the millions of devices still running XP in the wild. Vulnerable devices get compromised, and compromised devices become parts of a botnet. Botnets provide cybercriminals with a platform for everything from DDoS against websites to sophisticated account takeover and fraud. As official support for XP runs out, attackers will naturally rush in to take advantage of those left behind. Here is a quick breakdown of the numbers to help quantify the significance. Industry statistics of operating system usage can vary wildly, and current estimates of XP usage range from 10% to 28% of the total operating systems used worldwide. With an estimated 2 billion PCs in world, that means that somewhere between 200 million to 580 million devices will be vulnerable by definition. 2013 was a busy year for new Windows XP vulnerabilities, with a total of 88 new vulnerabilities reported. For comparison, this is twice as many vulnerabilities as were observed in 2012. 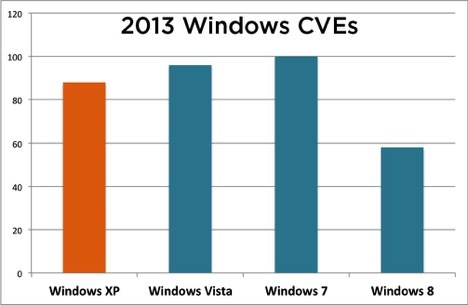 The comparative view of Microsoft CVEs shows that while XP is not the leading source of vulnerabilities, it remains a very significant source of new vulnerabilities. 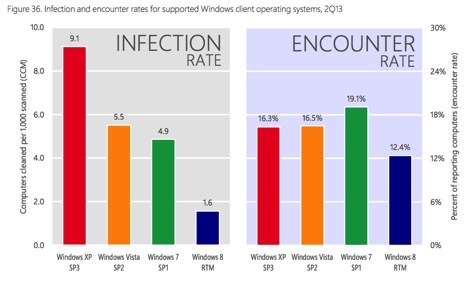 Microsoft’s latest Security Intelligence Report shows that while the popularity of XP is on par with other Windows operating systems, the infection rate is almost double that of more modern operating systems. These statistics certainly favor the attackers. 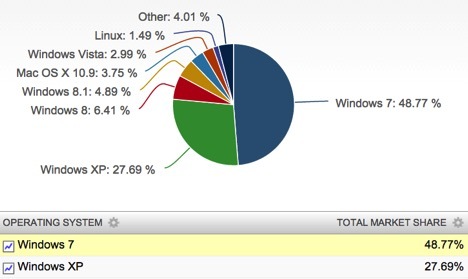 Even if enterprises manage the Windows XP end-of-life perfectly, all of the unprotected XP devices in the wild remain. This is why deflecting bots and automated threats has become so important for virtually any organization with an Internet-facing site or application. Clarification: Wade Williamson wrote this article. The news has been reeling with the announcement of the Heartbleed Bug. Want to know how the vulnerability works? Curious about how adversely this affects you or your organization? Our director of product security Michael Coates explains below. HTTPS is layered on top of Secure Sockets Layer (SSL) or Transport Layer Security (TLS) to enable a user to securely communicate with a website without tampering or monitoring from intermediate parties. However, on April 7, 2014 a serious vulnerability (CVE-2014-0160 – https://cve.mitre.org/cgi-bin/cvename.cgi?name=CVE-2014-0160) was uncovered within the TLS heartbeat extension in versions of OpenSSL that places the encrypted communication at risk. Attackers can leverage this bug to obtain the private keys from the webserver and use this information to decrypt and monitor communications that are taking place over SSL/TLS, exposing any sensitive data communicated by the user. Apache, which uses OpenSSL for HTTPS, is used by 66% of all websites according to netcraft.com (http://news.netcraft.com/archives/2014/04/02/april-2014-web-server-survey.html). A study of the TLS heartbeat extension by Netcraft also identified that 17.5% of SSL sites may be vulnerable to the Heartbleed bug (http://news.netcraft.com/archives/2014/04/08/half-a-million-widely-trusted-websites-vulnerable-to-heartbleed-bug.html). Yes – OpenSSL 1.0.1g was released on April 7, 2014 (https://www.openssl.org/source/). Impact of the vulnerability This vulnerability allows an attacker to extract memory contents from the webserver through the vulnerability in the heartbeat. As a result an attacker may be able to access sensitive information such as the private keys used for SSL/TLS. Active Attack – Equipped with the private key, an attacker can silently monitor and decrypt communications between the user and the web server. As a result, an attacker could view private data such as passwords, credit card data, medical records and any other sensitive data the user exchanges with the website. In addition, the attacker could impersonate the target website to deliver fake, inaccurate or malicious data to the user. Offline Attack – Some well funded attackers gather large amounts of encrypted data and store this data in the event they can later decrypt the information. Using the Heartbleed vulnerability the attackers could decrypt this information if it was obtained when passed between a user and a vulnerable website. This means that sensitive data exchanged up to two years ago could also now be at risk for exposure to attackers. Note: sites implementing Perfect Forward Secrecy are protected against this particular attack. Who might exploit this vulnerability? In order to decrypt data exchanged between a user and a website, the attacker must have access to network devices along the communication path. This attack could most easily be launched by state actors or criminal enterprises operating in collusion with network operators. In addition, individual attackers could leverage this vulnerability to attack individuals using a shared wifi hotspot. Unfortunately, no. An attacker exploiting this vulnerability will leave no trace within the webserver logs. As a result it is not possible to determine if vulnerable web sites have been exploited. Upgrade OpenSSL as soon as possible. Which large websites were impacted? A partial lists of large websites that are impacted can be found here. This list includes websites such as yahoo.com, stackexchange.com, eventbrite.com, okcupid.com, suning.com, and squidoo.com. What other concerns are there with this vulnerability? The Heartbleed vulnerability allows an attacker to extract information within the webserver’s memory. As a result, a wide variety of information could be at risk including sensitive user or system data. In addition to placing webservers at risk, OpenSSL is also used by a variety of network appliances. These devices could be subjected to attack to extract sensitive information within memory. Clarification: Michael Coates wrote this article.